Aisha begins a delicate investigation on a criminal organisation and begins to suspect that all is not as it seems. Will she escape the traps set for her? 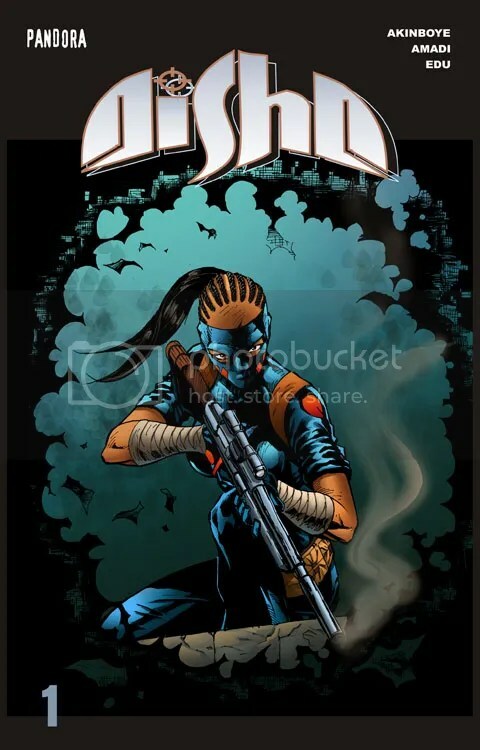 Aisha is a street orphan turned ninja crime-fighter battling powerful but mysterious criminal forces on the streets of Lagos, the largest and busiest black city on earth. First, thanks to World of Black Heroes for the notice about this book. Written and drawn by Akindoye Sunkanmi, who co-created it with Muyiwa Gbadegesin, this story opens with Aisha going to work, for an unnamed agency. At the HQ, her boss gives her an assignment, to assassinate a terrorist who was working undercover at another organization called the BMI. But when Aisha gets to the man’s apartment, she finds that someone has beaten her to him, as he is already laying there dead in a pool of his own blood. That’s when shots ring out, as Aisha is cornered by a team of armed BMI officers. What follows is several pages of a fight, as Aisha shows off her marital arts skills by single-handedly taking down the officers, without killing them. She manages to get away, but then is chased through the street by a helicopter, before finally giving them the slip. But now the BMI believe that she is their enemy and are gathering an elite team of soldiers to hunt her down. This is primarily an action-packed book, with lots of fighting and gunplay, but Sunkanmi also gives us a some quiet character moments, such as in the beginning, where we see the man whom Aisha is sent to kill, praying alone in his apartment, and a flashback showing Aisha seeing a dog die after being hit by a car when she was a child, and comparing the dog’s eyes to the eyes of the man she found dead. And it’s nice to see a comic set in Africa. The weak spots are that there is a lack of context and info on some of the main settings. Like, what is the agency Aisha works for? Who are the BMI, and what does that stand for? And there is mention of a terrorist group, the Shadrac Network, but no follow-up on that either. This first story, titled Along Came The Spider is listed as part 1 of 5, so I’m hopefully that future issues will bring more clarification, but it is off to a decent start. Chacebook rating of 3 AND A HALF STARS.